Waste industry leader awarded for third consecutive year. Cleveland, Ohio – June 22, 2017 – Budget Dumpster, one of the fastest-growing and most innovative waste companies in the U.S., has been recognized by The Plain Dealer as a 2017 Top Workplace in the small employer category. 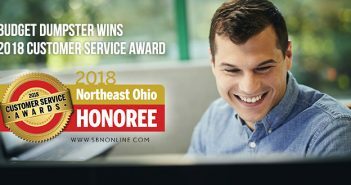 Top Workplace honors are awarded by The Plain Dealer to organizations whose employees rate them highly in the areas of career development, engagement, benefits and workplace culture. Budget Dumpster earned a spot on the list for the third consecutive year. The Top Workplaces Program is based on employee surveys administered by WorkplaceDynamics. The Top Workplaces lists are based solely on the results of an employee feedback survey administered by WorkplaceDynamics, LLC, and reported by The Plain Dealer on June 18. 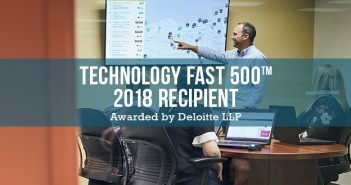 Along with numerous workplace awards, Budget Dumpster has recently been recognized as one of the top five fastest growing companies in Northeast Ohio and one of the fastest growing tech companies in North America. Find more information on The Plain Dealer’s Top Workplaces award and the full list of 2017 honorees here. 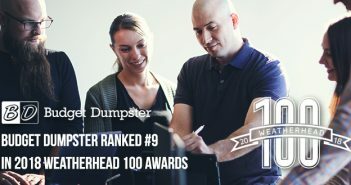 Based in suburban Cleveland with a growing team of over 90 employees, Budget Dumpster has been recognized as one of America’s fastest growing companies by the Inc. 500 (No. 873 in 2016), one of the top five fastest growing companies in Northeast Ohio by Crain’s (2015, 2016), one of the largest waste and recycling firms in North America (No. 67 in 2016) and one of Fortune’s Most Flexible Workplaces (2016). Learn more about how we help people and companies each day at BudgetDumpster.com.